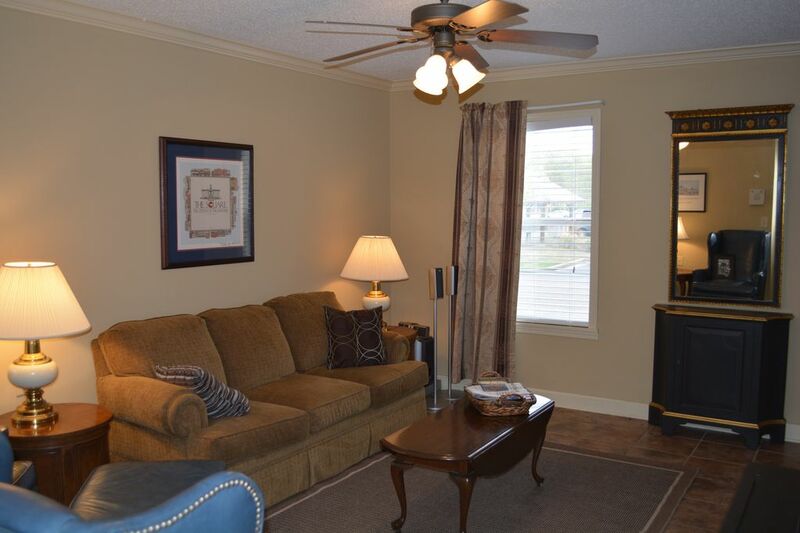 The condo is located in Edinburgh Place, a gated community less than one mile from the Ole Miss campus and stadium. This fully furnished 2 bedroom 2.5 bath sleeps 4 (has 1 Queen Bed and 2 Twin Beds), but if someone doesn't mind sleeping on the couch or you have a few air up mattresses then the world is your oyster depending how many friends you have. The back patio is nice to relax with a toddy or you can hang out in the living room and yell at the other conference games playing on the 40" TV while you wait for your lady friend to get dolled up for the Grove or Square experience. There are things like a washer, and a dryer and iron available. There are pots and pans, baking sheets, plates, bowls, glasses, but let's be honest - are you really going to be cooking? Oxford has some of the finest restaurants in the state of Mississippi. It's all there though, should you need it. The unit was clean. Its not within walking distance but close to Ole Miss. We enjoyed our stay! Stayed in this lovely condo for Double Decker weekend. Could not have asked for a quieter, more comfortable or convenient place to stay. The condo was immaculate and well-equipped. The owner communicated clearly and was very responsive to questions and concerns. Will definitely stay here again if we return to Oxford which we hope to do - Oxford is a wonderful place to explore! Great place to stay! Close to University! Really comfortable house! Very clean! Responded right away whenever we had any questions! Thank you! definitely coming back and staying here again! Close to campus and plenty of room. I enjoyed our stay. We had everything we needed and we were so close to campus. The place is very sweet and Rachel was very quick to respond. I wish I had known about this place before I booked a hotel for the upcoming LSU/OleMiss game. I will stay here in the future! The condo was in a great location, quiet area and very clean. Provided more than enough room for our needs. We would definitely stay here again. This property is located right off Jackson Avenue, which is the main road off Hwy 6 to campus. The Ole Miss campus is walking distance from our property. Any seasonal/event reservation is a flat fee 3 night minimum. Should you wish to stay longer, the 4th night will revert to the standard $150 a night. Please let the owner know if you wish to stay longer than the 3 night minimum.